Getting to Leukerbad (Loèche-les-Bains) in the Swiss Valais Alps is easy by car or train and bus from the Lake Geneva region as well as the rest of Switzerland. Leukerbad (Loèche-les-Bains) is an all-year resort town in the Swiss Valais Alps. Leukerbad is most famous for its thermal waters and claims to be the highest and largest Alpine thermal baths spa resort in Europe. 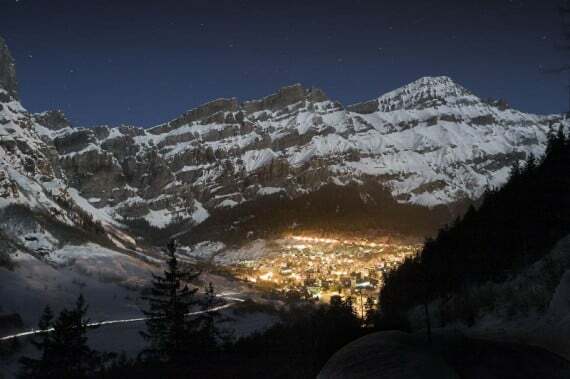 Fast highways and the Rhone Valley railway allow easy access to Leukerbad from the Lake Geneva region while the Lötschberg tunnel allow travelers by train and car to reach Leukerbad easily too from central Switzerland and regions to the north of the Alps. Leukerbad (Loèche-les-Bains) is located at 1411 m in the Alps of Canton Valais (Wallis). Leukerbad is on the right hand side of the Rhone River and thus on a south facing Alpine slope. From many parts of Leukerbad visitors can enjoy panoramas of the highest peaks in the Alps separating Switzerland and Italy. Getting to Leukerbad by car is very easy with roads accessible year round. The 25-minute drive (15 km) from Leuk (731 m) in the Rhone Valley to Leukerbad (1411 m) in the Alps is along a winding mountain road but requires no special skills. The road is cleared in winter and used by the full-size shuttle buses linking Leukerbad with the SBB railway station in Leuk. Two routes are available from Leuk to Leukerbad – the main road goes via Inden with the alternative route via Albinen. From the Lake Geneva region, follow the Autoroute A9 up the Rhone Valley until its termination at Sierre. From here it is a mere 10 km on national roads to Leuk. The faster road is to the south of the Rhone River (or Rotten) – not all maps show this relatively new route. From Leuk, follow the signposting through the small town to Leukerbad. From Milan and Italy, various tunnels and auto loading trains are available to reach the Rhone Valley and Leukerbad. Milan to Leukerbad is around 240 km (3h30). The closest railway station to Leukerbad is Leuk, which is in the Rhone Valley. From here, frequent buses take half an hour to reach Leukerbad. The LLB buses are CHF11.80 (½ Fare Card & Junior Card valid) per person. Swiss Railways sell tickets all the way to Leukerbad so rail passengers generally need not buy a separate bus ticket. The bus stop in Leukerbad is in the heart of the town near the Burgerbad – many hotels offer free pickups if necessary for guests. 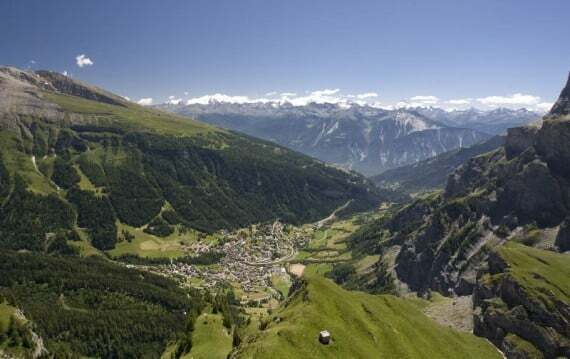 RailAway discounts are often available giving a saving on train and bus transportation as well as discount admission to the spa baths in Leukerbad. Enquire at train stations of online from Swiss Railways. 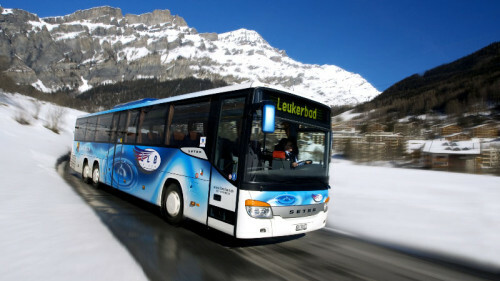 Taxis offer an alternative to the bus and may even be cheaper for small groups – a minibus taxi from Leuk to Leukerbad will be around CHF80 one way. Geneva Airport (GVA) has traditionally been the airport of choice when traveling to Leukerbad (Loèche-les-Bains). However, following the completion of the Lotschberg tunnel, the traveling time by train from Basel, Geneva, and Zurich Airports is about the same at just over three hours. For drivers, Geneva Airport remains the better choice. Taxi2Airport and Suntransfers give easy online quotations for transfers but the train will work out much cheaper for most.